With the nearly constant flood of data breaches that we read about almost every day, I thought I would take some time to cover the basic cryptographic techniques out there. I have avoided this so far because it is a rather difficult subject to explain without immediately going over many people’s heads. However, it is becoming increasingly clear that everyone, not just those using it on a daily basis, needs to understand just how encryption works.I intend this simply to be a quick and cursory overview of cryptography for the general IT practitioner, not a treatise on the algorithms and mathematics of encryption. I’ll try to familiarize you with the basic terminology and concepts so that when you read about hashing, wireless cracking, or password cracking and the encryption technologies are mentioned, you have some grasp of what is being addressed.I will attempt to use as much plain English to describe these technologies as possible, but like everything in IT, there is a very specialized language for cryptography and encryption. 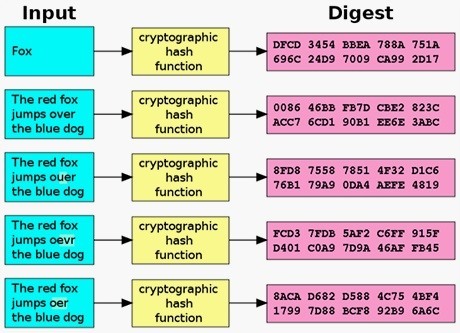 Terms like cipher, plaintext, ciphertext, keyspace, block size, and collisions can make studying cryptography a bit confusing and overwhelming to the beginner. There are several ways to categorize encryption, but for our purposes here, I have broken them down into four main areas. In the world of cryptography, size does matter! In general, the larger the key, the more secure the encryption. This means that AES with a 256-bit key is stronger than AES with an 128-bit key and likely will be more difficult to break. Within the same encryption algorithm, the larger the key, the stronger the encryption. It does not necessarily mean that larger keys mean stronger encryption between encryption algorithms. Between algorithms, the strength of the encryption is dependent on both the particulars of the algorithm and the key size. This is why hashes can be used to store passwords. The passwords are stored as hashes and then when someone tries to log in, the system hashes the password the user provides and checks to see whether the hash generated matches the hash that has been stored. In addition, hashes are useful for integrity checking, for instance with file downloads or system files. In the world of encryption and hashing, a “collision” is where two different input texts produce the same hash. In other words, the hash is not unique. This can be an issue when we assume that all the hashes are unique such as in certificate exchanges in SSL. At first glance, it may seem nearly impossible to find a useful collision. However, the NSA was able to use this property of collisions in the Stuxnet malware to provide it with what appeared to be a legitimate Microsoft certificate. The victim computers recognized this fake certificate as genuine and gave it all the access a true Microsoft certificate would have. Hash algorithms that produce collisions, as you might guess, are flawed and insecure. These are the hashes you are probably (or should be) familiar with. MD4 – This was an early hash by Ron Rivest and has largely been discontinued in use due to collisions. MD5 – The most widely used hashing system. It’s 128-bit and produces a 32-character message digest. SHA1– Developed by the NSA, it is more secure than MD5, but not as widely used. It has 160-bit digest which is usually rendered in 40-character hexadecimal. Often used for certificate exchanges in SSL, but because of recently discovered flaws, is being deprecated for that purpose. Symmetric cryptography is very fast, so it is well-suited for bulk storage or streaming applications. The drawback to symmetric cryptography is what is called the key exchange. If both ends need the same key, they need to use a third channel to exchange the key and therein lies the weakness. If there are two people who want to encrypt their communication and they are 12,000 miles apart, how do they exchange the key? This key exchange then is fraught with the all the problems of the confidentiality of the medium they choose, whether it be telephone, mail, email, face-to-face, etc. The key exchange can be intercepted and render the confidentiality of the encryption moot. DES – This was one of the original and oldest encryption schemes developed by IBM. It was found to be flawed and breakable and was used in the original hashing system of LANMAN hashes in early (pre-2000) Windows systems. 3DES – This encryption algorithm was developed in response to the flaws in DES. 3DES applies the DES algorithm three times (hence the name “triple DES”) making it slightly more secure than DES. AES – Advanced Encryption Standard is not a encryption algorithm but rather a standard developed by NIST. Presently, it is considered the strongest encryption, uses a 128-, 196-, or 256-bit key and is occupied by the Rijndael algorithm since 2001. Used in WPA2, SSL/TLS, and many other protocols where confidentiality and speed is important. RC4 – This is a streaming (it encrypts each bit or byte rather than a block of information) cipher and developed by Ronald Rivest of RSA fame. Used in VoIP and WEP. Blowfish – The first of Bruce Schneier‘s encryption algorithms. It uses a variable key length and is very secure. It is not patented, so anyone can use it without license. Twofish – A stronger version of Blowfish using a 128- or 256-bit key and was strong contender for AES. Used in Cryptcat and OpenPGP, among other places. It also is in the public domain without a patent. Diffie-Hellman – Many people in the field of cryptography regard the Diffie-Hellman key exchange to be the greatest development in cryptography (I would have to agree). 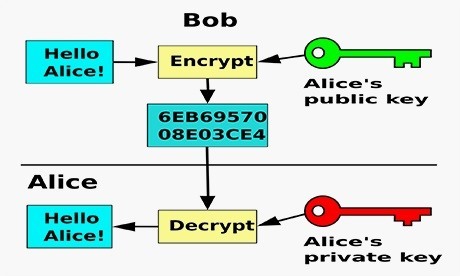 Without going deep into the mathematics, Diffie and Hellman developed a way to generate keys without having to exchange the keys, thereby solving the key exchange problem that plagues symmetric key encryption. RSA – Rivest, Shamir, and Adleman is a scheme of asymmetric encryption that uses factorization of very large prime numbers as the relationship between the two keys. 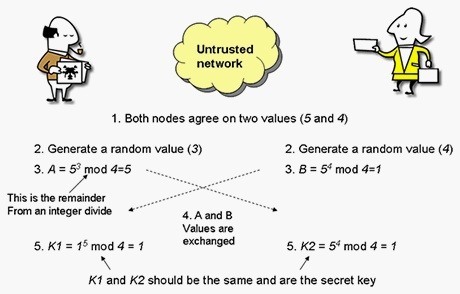 PKI – Public key infrastructure is the widely used asymmetric system for exchanging confidential information using a private key and a public key. ECC – Elliptical curve cryptography is becoming increasing popular in mobile computing as it efficient, requiring less computing power and energy consumption for the same level of security. ECC relies upon the shared relationship of two functions being on the same elliptical curve. PGP – Pretty Good Privacy uses asymmetric encryption to assure the privacy and integrity of email messages. Wireless cryptography follows the same principals discussed above, so I won’t go too deeply into it here. As you might guess, wireless cryptography is symmetric (for speed), and as with all symmetric cryptography, key exchange is critical. WEP – This was the original encryption scheme for wireless and was quickly discovered to be flawed. It used RC4, but because of the small key size (24-bit), it repeated the IV about every 5,000 packets enabling easy cracking on a busy network. WPA – This was a quick fix for the flaws of WEP, adding a larger key and TKIP to make it slightly more difficult to crack. WPA2-PSK – This was the first of the more secure wireless encryption schemes. It uses a pre-shared key and AES. It then salts the hashes with the AP name or SSID. The hash is exchanged at authentication in a four-way handshake between the client and AP. WPA2-Enterprise – This wireless encryption is the most secure. It uses a 128-bit key, AES, and a remote authentication server (RADIUS). I would love to do a deeper dive on Wireless Crypto at a later date, though I am not yet sure when that can be. Suffice it to say that WEP and WPA are entirely obsolete and should be avoided whenever possible. WPA2-PSK is what you will see in use for almost every home network, while WPA2-Enterprise is what is used for most enterprise deployments (surprise! ).